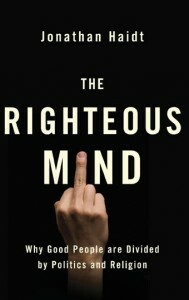 A podcast about The Righteous Mind explains why Obama is ahead. First, don’t you love the book cover. Next, here is the link to listen. I actually use this podcast that combines the thoughts and info on two posts on The Righteous Mind: this post is the actual review; this one is why Obama is ahead using the theories from The Righteous Mind. Let me know your thoughts on the content, but also on how I can improve the podcasts. Here’s the script if you would prefer to read. HI, EVERYONE. JOHN DALY HERE FOR INFORMED NOT INFLAMED. TIME FOR ANOTHER BOOK REVIEW. THIS IS ONE IS A GOOD ONE. IN FACT, IT COULD BE THE BASIS OF THIS WEBSITE. THE BOOK IS The Righteous Mind: Why Good People Are Divided By Politics and Religion. IT’S WRITTEN BY JONATHAN HAIDT. AND HE USES SCIENTIFIC RESEARCH TO EXPLAIN WHY OUR POLITICAL VIEWS ARE SO DIVERGENT IN AMERICAN SOCIETY. 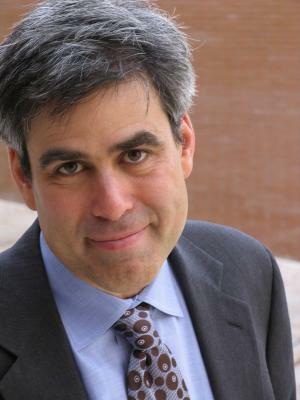 HAIDT ADMITS TO BEING A LIBERAL. BUT HE SHOWS GREAT SYMPATHY AND EMPATHY FOR CONSERVATIVES. IN SHORT, HE BECOMES ONE WITH HIS FINDINGS. GROUPS BIND AND BLIND. IT’S HAIDT’S GREAT LINE FROM THE BOOK. THERE IS A DOUBLE-EDGED SWORD TO OUR POLITICAL, FRATERNAL, BUSINESS, AND RELIGIOUS INSTITUTIONS. THEY BRING COHESION AND ORDER TO SOCIETY BUT THEY EVENTUALLY BECOME IMMORAL TO STAY INTACT. SO, WHO SHOULD READ THIS BOOK? POLITICAL HISTORIANS WILL ENJOY HOW A PSYCHOLOGIST EXPLAINS LIBERALS, LIBERTARIANS, AND CONSERVATIVES. SO, WHO SHOULD SPEED READ THE BOOK? THOSE OF YOU WHO FIND SCIENTIFIC STUDIES – AND SOME OF ITS MINUTIA – BORING CAN READ THE FIRST CHAPTER AND THE LAST TWO CHAPTERS. THERE’S A LOT OF LOCKE, HUME, DARWIN, DURKHEIM, AND MILL. PLUS, HE GETS INTO GENETICS AND ANTHROPOLOGY AS WELL. FOR SOME OF YOU, THERE MIGHT BE TOO MUCH – WHAT I CALL – “INSIDE ACADEMICS” ABOUT SCHOOLS OF THOUGHT THAT WERE NEGATED IN EARLIER DECADES AND ARE NOW BACK IN VOGUE. READ IT BEFORE THE ELECTION SO YOU WILL UNDERSTAND THE REACTION OF YOUR FRIENDS ON THE LEFT AND THE RIGHT – IN THESE WEEKS LEADING UP TO THE ELECTION. IT’S INTERESTING THAT HAIDT’S BOOK GIVES YOU INSIGHT INTO THIS YEAR’S ELECTION – AND WHY OBAMA APPEARS TO BE AHEAD IN THE POLLS. THIS IS MY TAKE ON THIS – NOT HAIDT’S. THE BOOK WAS PUBLISHED EARLIER THIS YEAR SO HE HAD NO IDEA WHAT THE POLLS WERE. BUT AS I WENT OVER HAIDT’S THEORIES, THIS IS HOW I APPLY IT TO WHAT WE SEE HAPPENING TODAY. THE FIRST ONE IS CARE/HARM. IN OTHER WORDS, CARING FOR OTHERS, PROTECTING THEM FROM HARM. THE THIRD IS LIBERTY/OPPRESSION, THIS CHARACTERIZES JUDGMENTS IN TERMS OF WHETHER SUBJECTS ARE TYRANNIZED. NEXT, LOYALTY/BETRAYAL TO YOUR GROUP, FAMILY, NATION. THE FIFTH IS AUTHORITY/SUBVERSION — FOR TRADITION AND LEGITIMATE AUTHORITY. SANCTITY/DEGRADATION, AVOIDING DISGUSTING THINGS, FOODS, ACTIONS. HAIDT FINDS THAT DEMOCRATS NORMALLY ATTACH THEMSELVES TO THE FIRST THREE: CARE/HARM; FAIRNESS/CHEATING; AND LIBERTY/OPPRESSION. HOWEVER, REPUBLICANS SEEM TO HAVE A STRONG TASTE FOR ALL 6 FOUNDATIONS. THAT’S WHY THE GOP AND CONSERVATIVES ARE FAR MORE PASSIONATE – THEY HAVE BIGGER TASTES FOR POLITICS – OR MORE THINGS TO PUSH THEIR BUTTONS. BUT REPUBLICAN THEMES SEEM TO HIT VOTERS ON A MORE EMOTIONAL AND PATRIOTIC LEVEL. SO WHY IS PRESIDENT OBAMA AHEAD IN THE POLLS? TAKING HAIDT’S THEORIES, YOU COULD SAY HE IS HITTING ALL THE MORAL TASTE TRIGGERS ONCE OWNED BY THE GOP. REMEMBER HIS ACCEPTANCE SPEECH. HE SPOKE ABOUT HELPING THE MILITARY ESPECIALLY OUR RETURNING VETS. HE HIT THE LOYALTY/BETRAYAL PORTION OF OUR MORAL TONGUE. HIS SPEECH TOUCHED ON THE AUTHORITY/SUBVERSION FOUNDATION WHEN HE TALKED ABOUT KILLING BIN LADEN. IN THE SPEECH, HE ALSO TALKED ABOUT PRESERVING THE AUTO INDUSTRY. SURE, THAT’S SOMETHING THAT WILL APPEAL TO LABOR UNIONS. BUT I HAVE TO THINK HE IS ALSO APPEALING TO THE TRADITION OF OUR AUTO INDUSTRY TOO. THE GOP AND THE GUN LOBBY ARE TRYING THEIR BEST TO PAINT OBAMA AS SOMEONE WHO WILL TAKE AWAY OUR GUNS. (IF I SEE ANOTHER EMAIL ABOUT THE STOCKPILING OF GUNS BY THE GOVERNMENT TO KEEP OBAMA IN POWER I MIGHT SHOOT MYSELF.) BUT THE REALITY IS THIS: NO MAJOR GUN LAWS HAVE BEEN PASSED TO RESTRICT GUN OWNERSHIP. THE EASY HOT-BUTTON GOP ISSUES ARE NOT THERE ANYMORE. LIKE CLINTON IN 1996, OBAMA HAS STOLEN GOP THUNDER. IN THE BOOK, HAIDT TALKS ABOUT THE FAILURE OF THE KERREY CAMPAIGN IN 2004 IN WHICH HE ONLY HIT 3 OF THE TRADITIONAL DEMOCRATIC TRADITIONS – THUS AN APPARENT REASON FOR HIS LOSS – AND A POSSIBLE REASON FOR OBAMA’S SUCCESS . SO THE BOOK IS THE RIGHTEOUS MIND BY JONATHAN HAIDT. FOR LINKS, CHECK OUT MY POSTINGS ON THE BLOG ON SEPTEMBER 24, 2012. Previous post: Podcast: So Informed Not Inflamed Is Not Just Daly Blowing Off Steam?!?!? Next post: Podcast: Is Benghazi Political Football or Legitimate Issue?